Welcome to www.rosescapular.net. We invite you to browse through our store and shop with confidence. We invite you to create an account with us if you like, or shop as a guest. Don't worry, if you are having trouble creating an account, just order as a guest, Either way, your shopping cart will be active until you leave the store. If shipping comes up wrong, as it sometimes does, don't panic we'll fix it. If we miss something please let us know, we are here to help. Please note**Sometimes there's a glitch and the shipping cost comes up wrong, if this happens we will fix it. 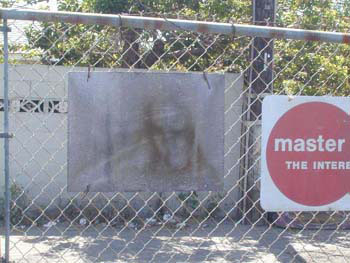 This image appeared on our back fence We thought we would share it with you. If any of you have miracles to share with us regarding our scapulars or products we'd love to hear from you. Our secure shopping cart is now up and running. PLEASE NOTE***Scapulars are not blessed and only need to be blessed at time of enrollment. Enrollment by a Catholic Priest is a one time for life enrollment. Enrollment papers are included with each scapular. 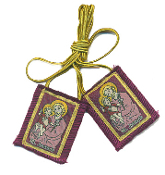 Our Scapulars are 100% Wool, sturdy and are the real deal. 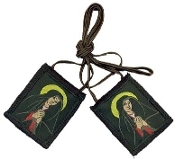 Please be careful about ordering scapulars that are imitation. In order to get the promise the squares must be 100% Wool. 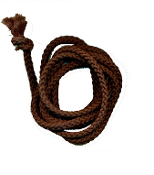 On other scapulars such as the Passion and the Fivefold the cord must be 100% braided wool. Imitation scapulars will not hold the promise when you die. Be careful. A brown Mt.Carmel Scapular can be either brown or black wool, any religious picture or if you prefer without a picture is ok also. It must not be ENCASED IN ANYTHING! It must hang freely about your neck. 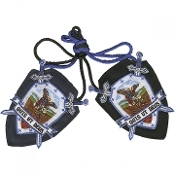 If you need a scapular longer or shorter or with a different picture we can help you, just ask. We are here to help the Blessed Mother put her garment on all of her children throughout the world. The days ahead may test our faith, make sure you protect those you love with Mary's Garment, Her Brown Mt.Carmel Scapular. Medals are an extra .24 cent each to keep this devotion going. Medals however are not required, it's just an option we provide. If you are a wholesaler you can email us or call us to get a coupon. joanne@rosescapular.com. Once you get the coupon code just apply it at time of checkout and it will reflect your discount. Otherwise please contact us for prices. 805.240.9228 . Note to our Wholesale customers. WE DO NOT DISCOUNT DVDS. BOOKS ON SCAPULARS ARE DISCOUNTED. Thank you for visiting and May God Bless you and your families.